Here's another discussion between Gary, Mark and Wo. This one started with the demise of France Gall on 7 January, but moved to Bob Dylan soon and his latest Bootleg Series release 'Trouble No More'. You can find Wo's review of the Spotify version on this blog here: https://wonomagazine.blogspot.nl/2017/11/trouble-no-more-bootleg-series.html. Mark's take on the 8 album release will shine through here alright. Only to wind up with 'Abbey Road' somehow. For us who grew up with pop and rock in the 1960s this is an awful period of grim inevitability that we will need to endure over the next 10 years or so. Once we had come to terms with David Bowie's death, the biggest shock last year was Tom Petty's recent sudden passing. I don't know any of France Gall's records - she didn't seem to follow Francoise Hardy's example in successfully extending her fan base into other countries' pop markets in the sixties before progressing into more serious, highly personal album-making. Speaking of Françoise, I was pleased as a collector over the last 20 years to see a two page "how to buy" feature on "French pop's existential romantic" in the current January edition of Mojo magazine. Ranked no.1 in their listing is the album I talked about in my previous e-mail: "La Question" from 1971 which is described as "intense, haunted and hypnotic....with a powerful dreamlike eroticism." Here comes the change in the conversation that is to split off in three ways, France Gall, Ray Thomas of Moody Blues and 'Trouble No More'. Mark read Wo.s top 10 albums of 2017 (see here: http://wonomagazine.blogspot.nl/2017/12/wonoblogs-top-10-best-read-posts-of-2017.html) and responded with his comments. Very interesting but have to admit most of these artists I'm not aware of! Typically I didn't buy many new releases last year so my antennae are not as well-tuned as yours, Wout - and I tend to be stuck in my long-established grooves - literally so in most cases* (see below). However, in my top 10 I would put Slowdive's wonderfully atmospheric eponymous album (a return after an absence off 20 years: they were Ride's "shoegazing" contemporaries in the early 1990s), the Stones blues return "Blue and Lonesome", Noel Gallagher's "Who Built the Moon" (play "Holy Mountain" LOUD!) and Steve Earle's "So You Wanne Be an Outlaw." On the archive front I am now working my way through the Dylan 8 cd boxset "Trouble No More" from the controversial 1979-81 period of intense evangelism. Some of the unreleased songs, rehearsals and alternate takes are a revelation of sublime lyrics and exhilarating musicianship (including Mark Knopfler). I have all the original albums but with this box set I now understand why Dylan's career took this particular direction - and it was not at the expense of his artistic integrity: quite the opposite. If you get a chance, listen for example to "When He Returns", "Rise Again", "Dead Man, Dead Man" and "Every Grain of Sand" (as a complete Dylan collector I now have four different versions of this song which I would rank as one of his greatest songs). On the Fab Four front, now that Pepperland has been thoroughly explored, I need to start saving up for The White Album box set (I wonder if it will be numbered....) due later this year. Giles Martin (George's son) had the daunting task of sifting the huge number of studio takes (over 70 for "Dear Prudence" alone). About 15 years ago I bought an original mono version (as with Sgt Pepper there are some noticeable differences to the stereo mix) which is now worth about £300. An Imagine box set is also on the cards this year apparently. Also due in March is a third Hendrix archive set of unreleased recordings (how many more are there?) entitled "Both Sides of the Sky" (following the "Valleys of Neptune" and "People hell and Angels" studio archive compilations from a few years ago). As for new releases in 2018: I'm still hoping Gillian Welch will release a new album: a notoriously un-prolific but top notch songwriter, it's now over 6 years since "The Harrow and the Harvest." 2011 was also the last time Tom Waits released an album ("Bad As Me"): will we see him return to the racks? * Flying back from Japan via Helsinki a couple of days ago, the Finnair in-flight magazine had a feature on the vinyl comeback - a sign of the times. I wasn't aware when at last summer's ICANN meeting that Helsinki has some very good second-hand record shops. Like Mark, I am not familiar with most of your top releases… and also like Mark, I have not bought much in the way of recordings as I am starting to depend on Spotify or Apple streaming, only resorting to my vinyl collection when I want to listen to quality music time! There is a local record market that takes place every month or so, so I may be saving my pennies/cents to get some more acquisitions later this year! I hope you both had a great New Year, even though I know that Mark had a rather sad event before Christmas…. Yes, I saw both in the news yesterday, but was too busy to respond before now. First, all the best for 2018! I think I wrote all there is to write for me on France Gall. There are three songs I know by her. One from the 60s and two from the 80s, which are both very sophisticated pop tracks. Ray Thomas is of course someone a little more in the background of the Moody Blues. Yet his keyboard work was very defining for the band's sound. This morning the radio station of service honoured him by playing 'Question', the band's only #1 hit song over here. It was a long time since I heard it. I noticed that I appreciated the quiet middle so much more than way back then. The loud part remains formidable, the contrast makes it superb. I can imagine a lot of people at record companies frown over a single like that. "Too difficult", "too strange". Coming back to 'Trouble No More'. I was given the double cd version for my birthday recently. So far I had only heard the compilation on Spotify. Again Dylan surprises me with the strength of his work. I already knew that the best songs of his religious albums would have made one great one. There was much more, only hardly anyone wanted to hear at the time. I can remember the outrage in the music press when the journalists started to understand what was going on. Dylan had become anathema to them. Only to survive yet another storm in his career. On the Dutch music. Yes, I highly recommend listening to 'Another Place' by Maggie Brown. As lovers of things prog, the album by Soup, 'Remedies', comes highly recommended for you. A great and extremely dynamic album. Very sad news, The Moody Blues are to be inducted into the Rock & Roll Hall of Fame later this year…..
Coming back to Moody Blues. It turned out that the two record stores I went to yesterday afternoon had all its albums 2nd hand except for the one I had come to buy, In Search Of The Lost Chord. Patience is a nice thing. Instead I came home with Noel Gallagher's last effort. So will know soon enough if Mark is right and let it grow on me. His previous album I truly liked better than most Oasis albums. Also a recent 12# single by Mick Jagger I didn't know existed. So enough to listen to today. I only hope that the San Francisco 1980 concert recording of "The Groom's Waiting at the Altar" with Carlos Santana is on one of your two cds: majestic, epic, stonking, storming, spine-tingling...God I wish I had been there! You have to play it LOUD! As the book points out, this is an example of a masterpiece that Dylan recorded in the studio for Shot of Love but inexplicably decided at the last minute to cut from the vinyl version (but was included on the cassette apparently*). Uniquely in Dylan's recorded history, it was added eventually to the cd version of the album presumably because it had gone down so well in concerts. If not a cassette buyer, prior to that you had to get the single "Heart of Mine" as it was served up as the B-side of that. Non-album B-sides: collectors just love them! However, that's a whole new topic!. *I was not a cassette collector but tape-length timing constraints could have unexpected consequences. My wife had a copy of Abbey Road. I say "had" because it is now in my Fab Four collection! When I played it in the car (no cds at that time) I thought hey what the heck's going on? It has a different running order: why? Because side 1 is 4 minutes or so longer than side 2 soo they had to switch songs around to even the timings up. The result is the only legit Beatles album that starts off with back to back two George Harrison's two greatest songs - and some might the strongest songs - nay,masterpieces! - on the album: Here Comes The Sun and Something. Side 2 kicks off with "Come Together" followed by "Because" It is funny how different running orders can create a new feel to an album: with "I Want You" finishing the first side that's three Lennon songs in a row but each with a very distinctive style and arrangement. This original cassette goes for 25 quid these days on ebay (but don't tell my wife!). I read the other day that pre-recorded cassettes and mix-tapes (didn't you just love doing those?!) are now following vinyl back into vogue - streaming, bah! And I was delightfully surprised that in Japan a couple of weeks ago to see cassette-radio recorders still on sale in department stores. Streaming? Just a fad! Very interesting Mark, and no, I was not aware of the ‘re-ordering’ of album tracks were done like that….but it makes complete sense, even a few meters of tape saved on a cassette will make a big production saving to the company! This may sound like sacrilege to you devotees, but I have never been a big fan of Dylan! Yes, I respect him (and quite rightly), yes, I love some of his writing (e.g. All Along The Watch Tower as performed by Hendrix…. Who I know was a big fan of Dylan), but his performance and recording never turned me on… man! I have a good friend (ironically named Bill Lennon - yes, his real name) who dies an excellent tribute concert, and I really enjoyed that…. But I just can’t get into the original, don’t know why? But I did like 'Subterranean Homesick Blues’…. Excellent song and film idea! Interestingly, there is money to be made transferring old media formats into current ones…. I have some VHS tapes that I recorded years ago, they cost about £25 to convert into DVD or a data file… so maybe keeping some old quality audio/visual equipment may be a future pension supplement?! One of the VHS tapes is of my eldest daughter on a children’s TV programme and another of myself, ahem!…. on Channel 4 News at the Millennium Dome giving advice to a job seeker (I was working in a Job Centre at the time… a year before you interviewed me for a job at DTI! )… with me (conscious of the TV camera and nervously trying to think of anything sympathetic to say) coming out with the cringing line “It must be like the sword of Damocles hanging over your head?”…. As soon as I said it, I regretted it! 'Groom Still Waiting At The Altar' is one of my favourite Dylan tracks since the mid-80s. 'Biograph' was one of the first Dylan albums I had (on tape) from a friend of a friend who had the, what we would now call a box set. To my amazement I found that this song was a B-side from a fairly dismal album I had and have. 'Every Grain Of Sand' of course being the one fabulous song on the album. The song has so much power. My version on the double cd is not with Santana unfortunately. A strong version, but not special. 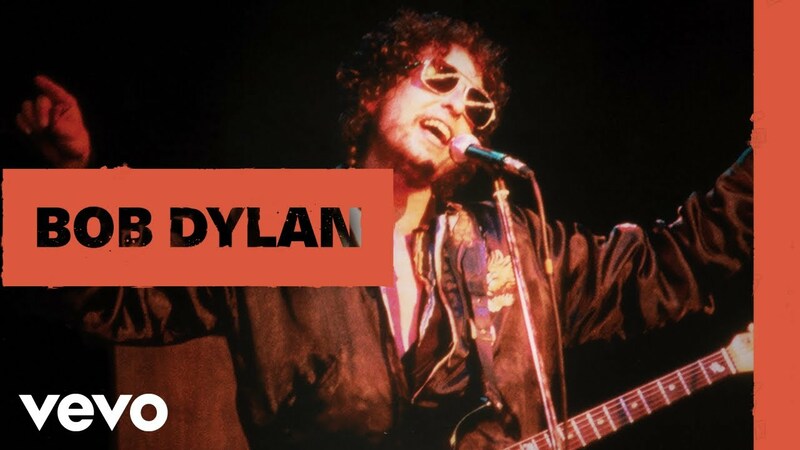 Dylan is far ahead or behind the backing ladies, creating a few awkward moments stretching the song beyond where it ought to be stretched and still he gets away with it. The famous Dylan phrasing and timing, I guess. I have never been one for cassette tapes really, although I had some at the time. Recently a 30 something bought the last cassette copy machines in this country from a person who decided to retire. According to the newspaper article the demand is rising again. So there you go. Nice to find this difference, Mark. Everyone I talk to comments that the recent vinyl rise of sales is just a fad. It may well be. What my experience is over the last 10 years or so, is that I have lost all attachment to music due to the over-availability and streaming of songs. There's simply no way that I connected on a deeper level with much of that music. Now that I'm back to vinyl for the albums I truly like, that bond is there once again. For some certainly like with my first albums, I guess. Simply because they are so ridiculously priced that I don't want to buy too many all at once. Next to missing the time to play them as much as I could as a teenager. Whether sales will stick with today's youths? Time can only tell. Noel's album's first to play. BTW, I was given Led Zeppelin's I and III (in the original package!) albums on vinyl recently as a present. Man, what a powerful experience that is. What an albums. What a sound. Here is the 1980 San Francisco version with Santana on (if you can bear it! 😉) VEVO: https://youtu.be/X1k0tYy6p-I I have to admit, this is a gem! Mark will tell you we used to have lively discussions at work with a few others on the (and to paraphrase...) “reports of the death of vinyl are grossly exaggerated”…. But I think we are all surprised just how popular it has become not only with the 'baby-boomer' generation but also with young people as well! I think it is for the very same reasons that you mention that there is that connection with music when you put that platter on the turntable and sit down to listen. I think it must be the way you have to follow an almost ritualistic path when playing an album? First you have to think what it is you want to listen too; then you have to find that precious 'LP’s worth of toons' (to quote Todd Rundgren); then you gingerly pick up the album glancing at the enticing cover and then gently ‘undress’ the vinyl and place her gently onto the turntable (steady boys! ); ‘turning on’ the deck and placing the stylus and arm, oh so carefully, onto the edge of the record and respectfully close the dust cover over the deck; then returning to your comfy chair (big assumption here! ); sit back and relax simultaneously picking up the sleeve and settling down to enhance your aural entertainment…..
You can’t really do that with digital! This is exactly what I mean, Gary. So well described. I had lost that feeling for years, starting with cds and then downloaded MP3s, let alone Spotify and very glad to have recovered it.